Note: You can enter this giveaway two (2) times per e-mail address per day. Deadline is 11:59PM ET 4.19.19. Company coming? Now you can make tea for two…or three…or more. 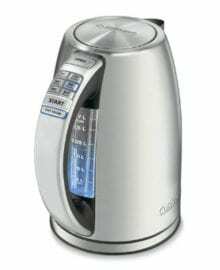 The Cuisinart Electric Cordless Tea Kettle has a 360-degree swivel power base for added convenience to heating and serving your hot beverages. The stay-cool nonslip handle and dripless pour spout keeps you and your kitchen safe and dry when you pour boiling water for this Hershey’s Chocolate Cake recipe or when you want to peel tomatoes for an Easy Gazpacho. The ultra-fast heating, 1,500-watt kettle also features a blue backlit water window so you always know how much of the 1.7 liters of water is left inside. And for added safety, it has an auto shut-off feature. NO PURCHASE NECESSARY TO ENTER OR WIN. Void where prohibited by law. Open to legal residents of the 50 U.S., D.C. and Canada (excluding Quebec) who are at least eighteen years old at the time of entry and have internet access. Begins on 2.22.19 at 12:00:00 a.m. ET and ends on 4.19.19 at 11:59:59 p.m. ET. To enter the giveaway, submit your full name and email address on this form. Odds of winning this giveaway depend on the total number of eligible entries received. Only two (2) entries per email address per day. Sponsored by Leite’s Culinaria, Inc. For more information, visit our Official Rules. Be sure to add giveaways@leitesculinaria.com to ensure notification if you are the winner.